Yesterday’s bullish candle also came at a key support level, shown dotted above. Both teasingly keep bull and bear cases in tact. However, the potential for a market crash remains present with the extremes reached in sentiment, leverage, Skew and positioning, echoing May 2010 and 1987. A little more retracing of the falls over the next few days would fit, creating a head and shoulders pattern and teeing up declines in February. Why not head to new highs on all indices? Firstly, I had a multi-angled case for a market top 31 December 2013, which is so far being honoured on Dow and Nikkei (and Sp500 double top). Secondly, this is a parabolic top rather than a topping range, and we see typically see similar lower-high second-chance patterns on parabolic bubble charts, as opposed to marginal higher highs on divergences in topping ranges. Thirdly, there is a change in backdrop here in January: economic data has started to disappoint in line with leading indicators having predicted an economic peak between November-February and we have seen money flows into treasuries and defensive sectors away from cyclicals. 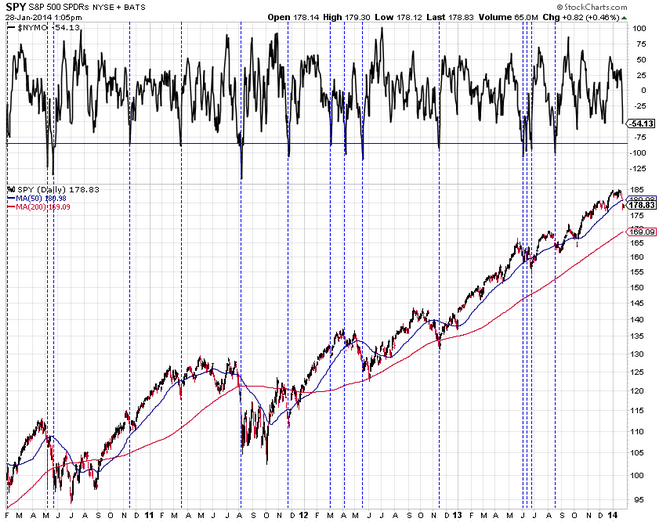 Fourthly, the correction in equities over the past week has further to go, by multiple indicators. Friday was a 90% down major distribution day, and typically from a new high they normally come in clusters of more than one. Yesterday’s volume was unimpressive which also hints at more downside ahead. 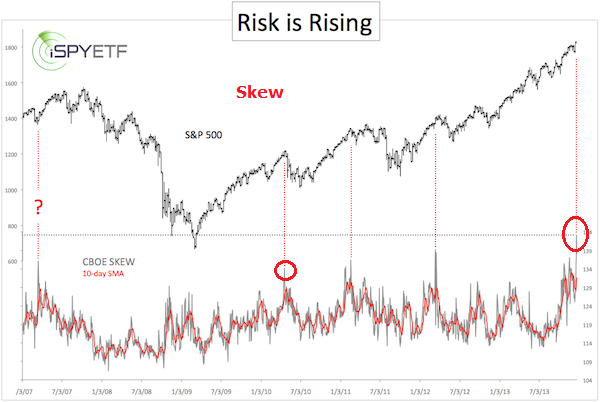 Skew remains elevated and divergence in breadth has increased. 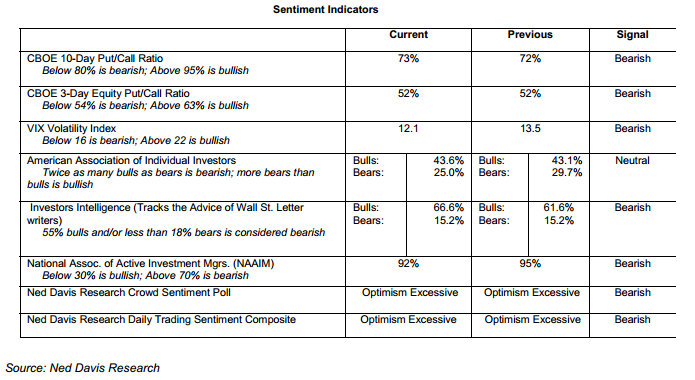 Sentiment measures are still lopsided. It has now reached 2.6% of GDP, similar to peaks in 2000 and 2007. With January’s price action in the stock markets, I expect that may turn out to be the peak in leverage. 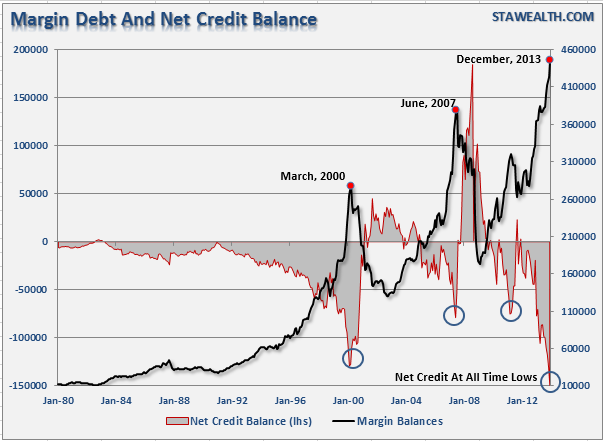 If margin debt, stock indices and the solar maximum peaked out at the end of December it will echo March 2000 where all peaked out together. It remains too early to judge whether commodities are going to rally as a class as late cyclicals. Precious metals continue to base but are as yet without momentum. I believe that will come once equities more clearly enter a downtrend. Energy has been firmer, in part linked to the US cold spell, but whether oil and gas can rally if stocks more sharply decline remains to be seen. The risk-off days that we have seen have typically been pro-yen and anti-dollar, which could mean we see the support for commodities of a declining US dollar, should those equity declines erupt again. Soft commodities have yet to advance in a meaningful way, but scientists believe El Nino is forming and historically this has been positive for agri prices through the supply effects of increased droughts and floods. El Nino years have produced some of the hottest years on record. Global temperature variation has a correlation with solar cycling once the global warming trend is removed, so the combination of the solar maximum and El Nino would give potential for a new hottest year on record, but we will see how things develop. China’s repo rate remains elevated heading into their week-long holiday. The markets welcomed Turkey’s large rate hike, but emerging market issues continue to simmer. US earnings reports this season have so far had a similar theme to previous quarters: poor revenues or weak sales guidance, profits through cost cutting, and share buybacks. 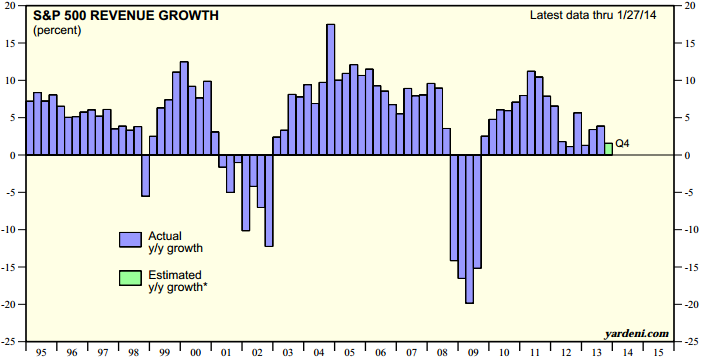 The blended earnings growth rate for Q4 is 6.4% so far, but the blended revenue growth rate is just 0.7%. Barring some stellar revenue reports in the remainder of the earnings season, this is another impediment to further price gains in US equities. Estimates vary, but HFT black-box computer trades may account for 50% of all stock market trades, and they were a significant factor in crashes as old as 1987 to as recent as 2010’s flash crash. They are designed to act in the market before humans can, and hence their collective action can at times compound and trigger very fast, large price moves. Circuit breakers are now in place on the stock indices, designed to close the market for anything from 15 mins to the rest of the day, depending on the depth of the declines. They don’t prevent further selling once the market re-opens – they are designed to give time to reconsider, but the predominance of crash days on Mondays suggests time to reflect may in fact increase fear. The May 2010 flash crash was initiated with a large sell order set against an almost complete absence of buyer orders, then multiple and successive trigger sells. The algorithms used in computer trading vary, but they include mean reversion strategies, trend following and stop-losses. Recently we have built up a significant range of extremes from means, including sentiment, valuations, leverage, distance above moving average and time without a significant correction. 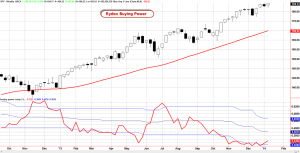 Thursday and Friday last week provided price action to break the uptrends in multiple indices and stocks. Here is a compilation of indicators that reveals the same signals are in place now as were at the May 2010 flash crash. Click to view larger. The backdrop now mirrors the 2010 crash backdrop, only this time round we reached greater extremes in all seven indicators. This suggests another crash is probable, and the depth of the crash likely to be larger. 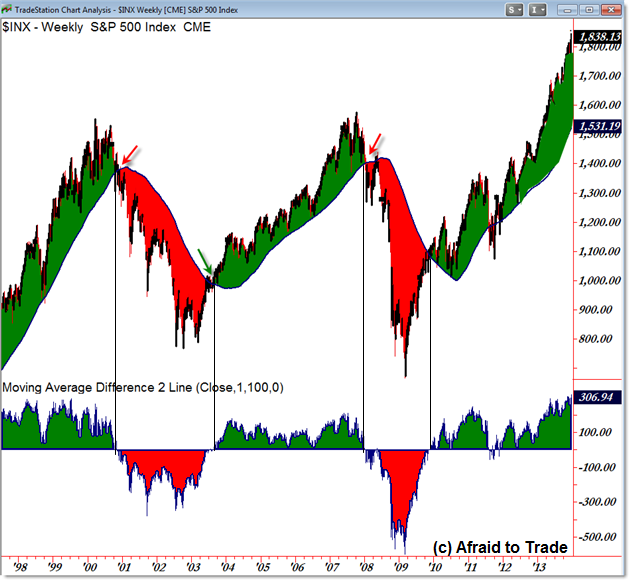 Drawing on those historic topping process parallels, it is possible buyers and buy programmes re-emerge this next week and it is still a bull-bear battle, but with a downward bias, pushing true market crash action out into February, March or even April. However, Friday’s one-sided price action together with the predominance of historic Monday crashes and the mirror backdrop to May 2010 (only more extreme in all signals) gave me a sense of urgency about putting this out today. 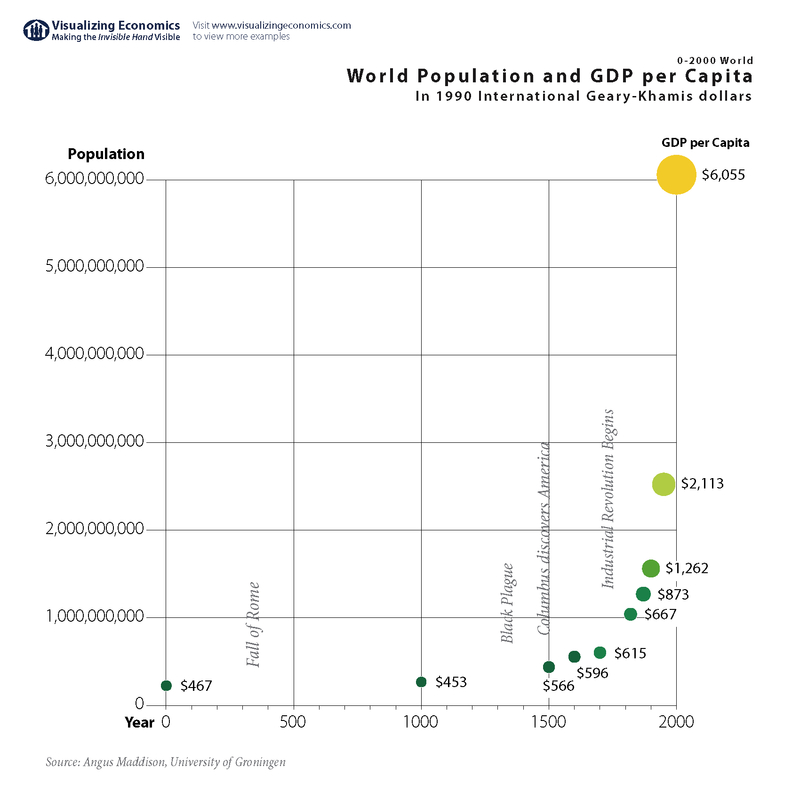 Economic growth occurs two ways: increasing population and increasing productivity per capita (which can be achieved through technological evolution and improvements in organistation/management/systems). Both increase overall GDP. A principle of the globally adopted capitalist economic model is that compound growth enables long term poverty reduction: that people can pursue their own self-interests and help themselves to disproportionate shares of the pie as long as the whole pie grows so that more people find themselves better off than less. Hence countries typically target 2%-10% annual growth, which when compounded means exponential growth. 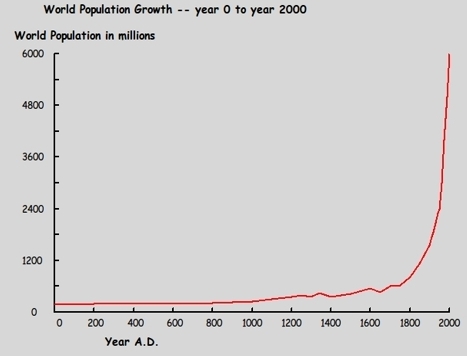 To achieve exponential economic growth we need either exponential population growth or exponential per capita growth (ideally both). The latter reflects human progress and technological evolution whereas the former is more of a ponzi scheme, requiring ever increasing numbers of people to maintain an ‘illusion’ of increasing prosperity. 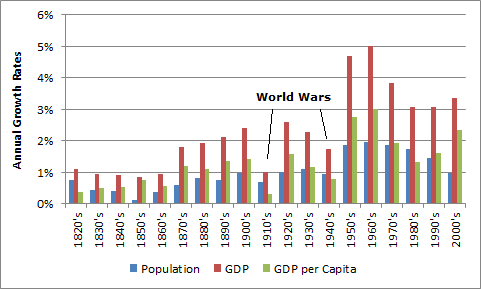 World GDP growth and GDP per capita growth also trended to a peak. 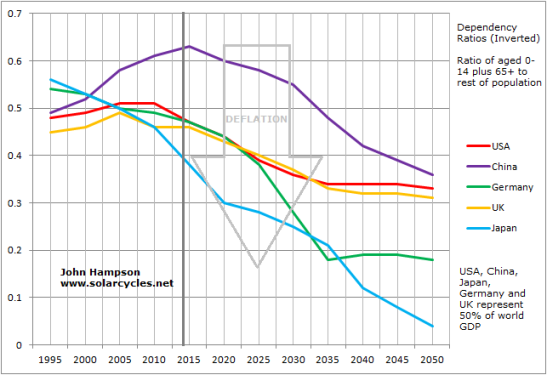 The trend in long term solar variation suggests we are now headed for another minimum, like the Dalton or Maunder. These historic minima corresponded to lower GDP growth and lower population growth, cementing the relationships between the three. 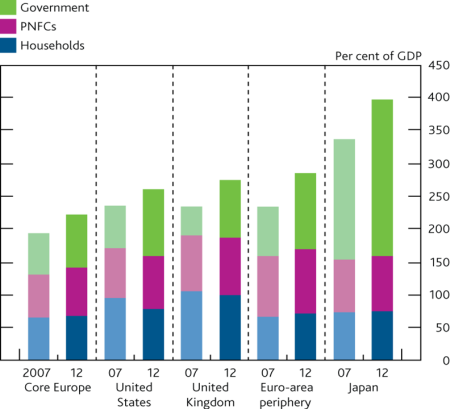 As did growth in energy supply. 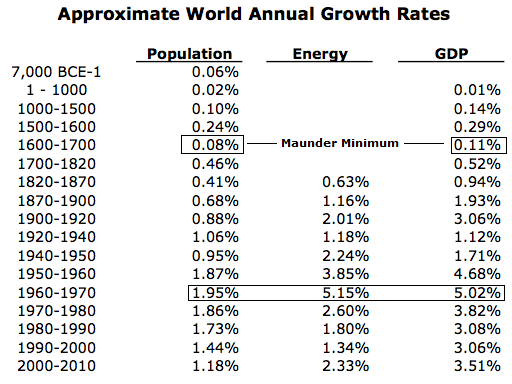 Declining rates of growth in population, GDP, GDP per capita, inflation and energy supply spell major trouble for a global system reliant on exponential economic growth as well as inflation and employment targetting. However, the true impact of this has been postponed in two ways. 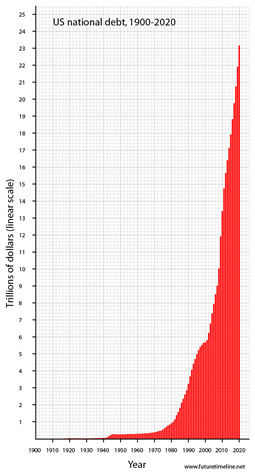 However, we have reached the point of debt monetisation in US, UK and Japan, i.e. the end game. The question is how long the end game can last. Secondly, sub-demographic trends of the major economic nations have largely been supportive since the 1970s, peaking out in phases. 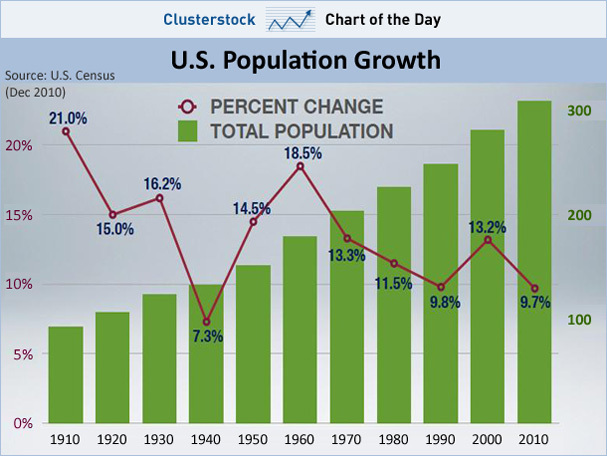 Here is US population growth per decade. Forward it by 40 years so that the births become the important ‘middle’ age bracket and we get the secular trends in real US stock prices: down into 1980, up into 2000, then down projected out to 2030. 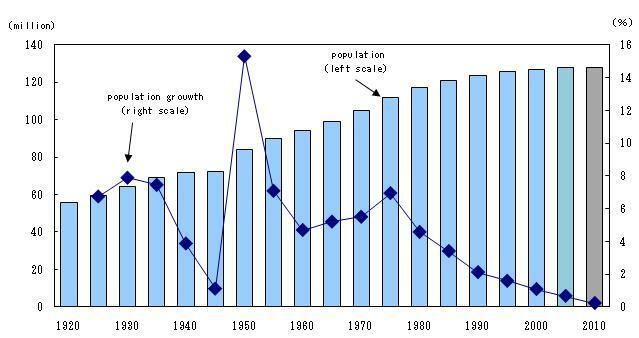 Here is Japan’s 5-yearly population growth rate. Again, forward it 40 years and we have a big spike in the middle bracket to deliver a major peak in equities and real estate around 1990, a small relief uptrend in the current window 2010-2015 (as we have been seeing) and otherwise a fairly grim outlook. 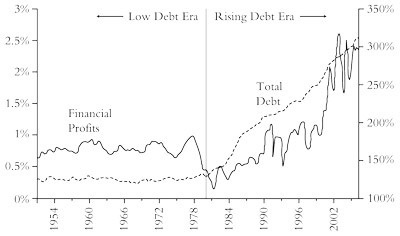 In summary, we have postponed the impacts of the major growth rate peaks (GDP/GDP per capita/population) of the 1970s through debt until we have reached the point of monetisation, and the support from demographic sub-trends of the major nations has now expired. Solar maxima have historically given way to recession, and solar variation predicts a new grand minimum ahead which has historically correlated with low GDP and population growth. I am therefore led to the fairly bleak conclusion that this solar maximum speculative peak will turn out to be a major historic peak for the world. 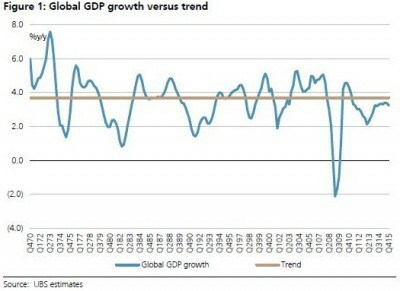 Permabears turned bullish, normally reliable analysts ignoring a flood of warning signs, a united view that the US and world economy is returning to solid growth this year which is based on little other than hope, and mass complacency. Just the way it should be at a solar-maximum-inspired speculative finale, and great to see it first hand. Don’t lose sight. Each of the warning signals that I compiled HERE (to which we can add insider selling, Rydex buying power, RSI divergences, and money flows out of consumer discretionary equities and into gold miners and treasuries) has been a reliable historic indicator of either a correction or bear market. To have them all in congregation is rare indeed, and a trader’s opportunity. There is no doubt in my mind that this will all look obvious with hindsight once a major correction kicks in, but for now the majority don’t buy any other scenario for equities other than up. Which brings us to the near term action. 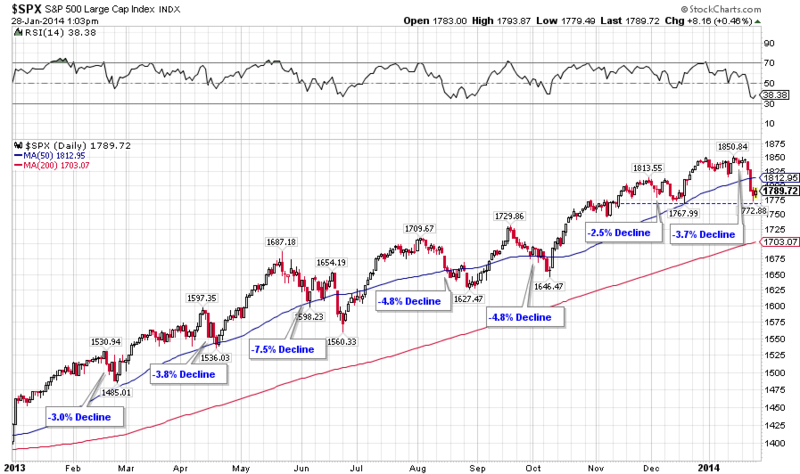 The stock market since the turn of the year has been a bull-bear battle and an overall sideways range on US indices. The Nasdaq and Russell have been edging up to new highs, whilst the SP500 has tracked overall flat and the Dow has been in a downward bias. At this point it remains to be seen whether the bulls will resume control and break the markets upward further into steepening parabolic, or whether the bears are about to become the dominant force and begin the correction. The bull-bear battle should continue but the bears should overwhelm from here and drive the action. If I am wrong and the market breaks upwards, then we have the lunar positive fortnight to support this, together with low forecast geomagnetism, and I would look to the next new moon of 30th January to potentially mark a top. But for now, I remain optimistic that the bears will take the edge here. 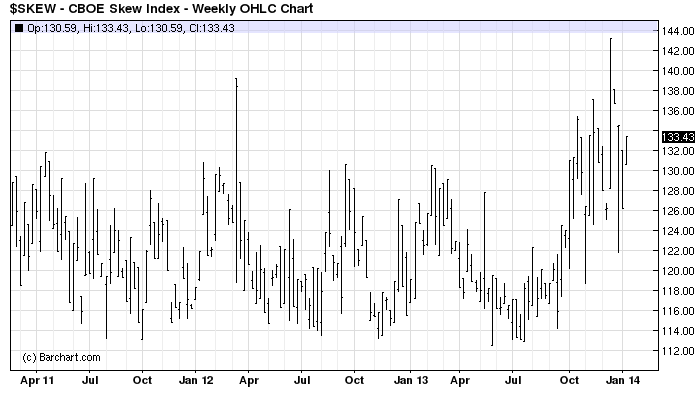 We have seen recent signs in gold miners and treasuries holding up and advancing, even as equities have been rising. We have also seen a breakdown in the consumer discretionary sector which has been a key leader of this bull. Below are daily charts since 2009 for Google, Amazon, and Biotech, all leading stocks/sectors in this bull. The parabolics are clear to see, and Biotech has particularly gone vertical, which suggests a blow-off top is likely before the month is out. We need to see all three break. Until then they remain the embodiment of the danger to the bear case: that we first break upwards in an even steeper parabolic in US indices, before a collapse occurs. 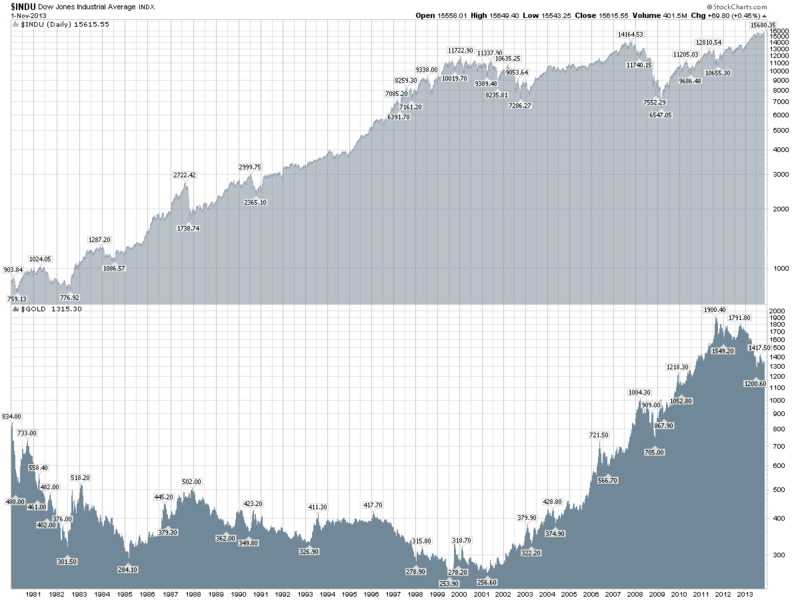 I end with the SP500 monthly chart which shows the difference in the technical shaping of the 2000 and 2007 tops to now. 3. 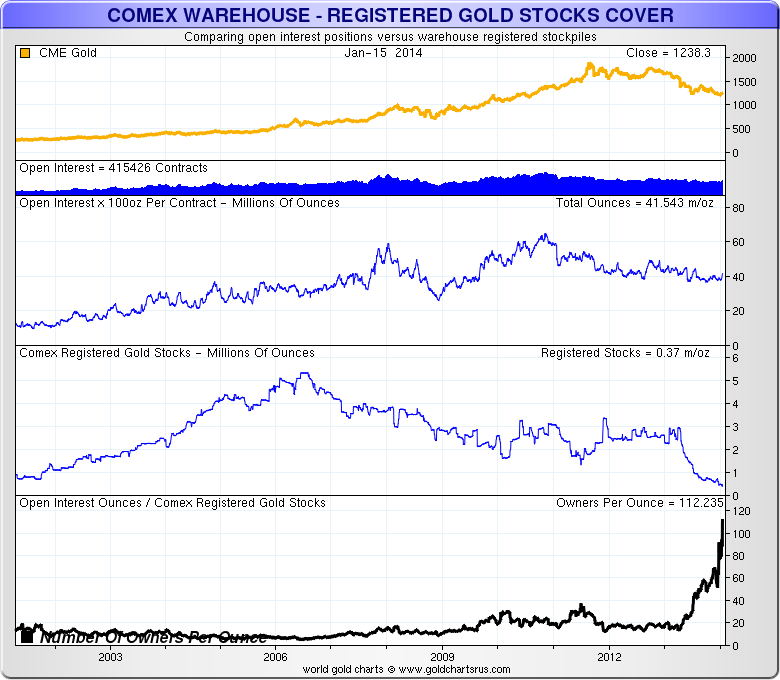 Comex gold stocks that are eligible for delivery versus open interest has risen to a historic extreme of 112:1. This means that the gold owners will demand higher prices to put their gold up for delivery and is bullish for gold prices. Now to the solar findings. 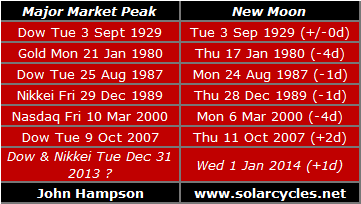 Below is a chart showing the last 4 solar cycles. In the last 4 decades there have been 3 major real estate peaks in the US and UK: 1979, 1989 and 2006/7. There has been one in Japan: 1991. 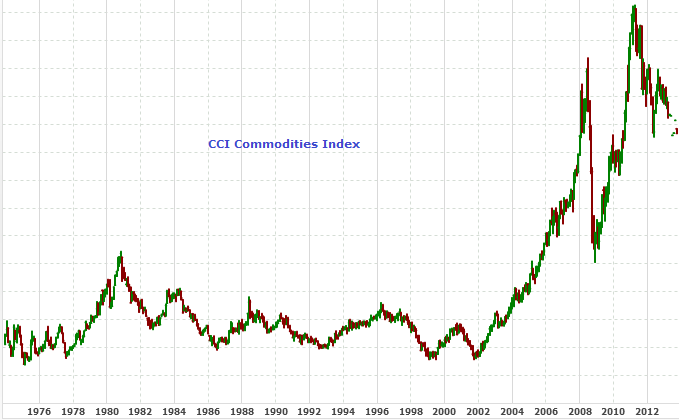 In the last 4 decades there have been 2 secular peaks in the CCI commodities index: 1980 and 2011 (which exceeded the 2008 high). In the same period we saw one major secular equities peak in Japan in 1989 and two major global equities peaks in 2000 and 2007. All are annotated below. The theme of major market peaks falling at solar maxima is again revealed, but two recent anomalies stand out: the equities and real estate peak of 2007 falling at a solar minimum, rather than a solar maximum; and the commodities speculative peak of 2011 falling on the rise towards SC24 maximum. Tackling the first, that 2007 peak gave way to the 2008 financial crisis, in which we saw crashes in real estate, equities and crude oil prices. This is in keeping with other crashes and crises that have historically occurred around solar minima. 1987’s historic crash in equities took place near a solar minimum. 1994 delivered a treasury bond market crash. 1997 saw the Asian financial crisis and a crash in equities. 2008 the aforementioned multi-asset crashes and financial crisis, and 2010 the flash crash in global stocks. All saw significant price rises into the crashes/crises. Central bank policies of this last decade were particularly friendly to asset bubbles, hence a suitably large boom and bust. Turning to the second anomaly, one possibility is that commodities have not yet peaked and go on to make a higher high than 2011 in a late and swift cyclical charge as equities top out. If they have already made their highs, then one explanation for their early peak on the SC24 maximum could be that China’s demographics topped out around 2010, and as the main driver of commodities demand the speculative finale had an earlier bias. China’s demographic trending to peak is perhaps better reflected in the bull market in commodities from 2000 than in their brief stock market mania around 2007. Most aren’t far from average cycle lengths, but May 1947 was a year shorter, July 1989 shorter still, and if this smoothed solar maximum turns out to be around December 2013, that will be a much longer one than any of the others. Even if the smoothed maximum turns out to be Feb 2012 (the smoothed max to date) it will still be an outlier on the long side. If lunar phasing still works despite artificial lighting and is to some degree ‘hard coded’ in human evolution, could sunspot cycles be too? Do we see evidence of human excitement through speculative peaks occurring around 11 years 1 month after the last solar maximum on those occasions where solar maxima occur significantly earlier or later? The last smoothed solar maximum was March 2000. Add 11 years 1 month and we get April 2011, which is where we saw speculative peaks in silver, cotton, coffee, rare earths and others. 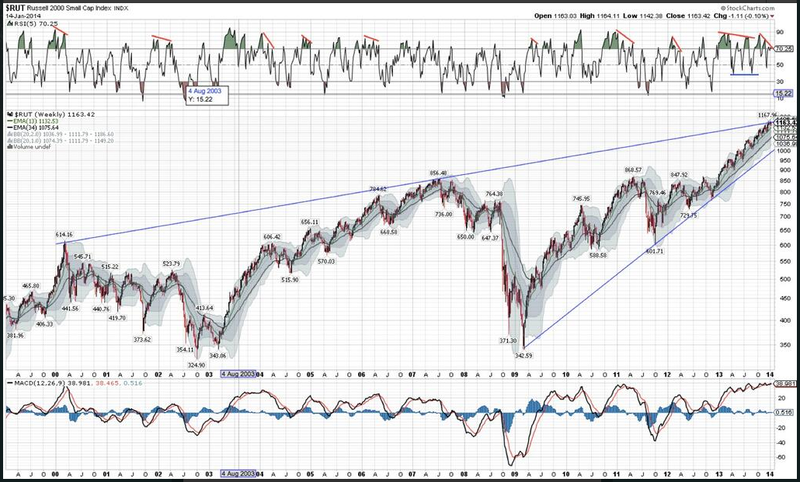 However, we also see evidence of a speculative peak occurring now, at the likely smoothed solar maximum, as evidenced in many indicators and measures of equities. July 1989 was an early outlier. 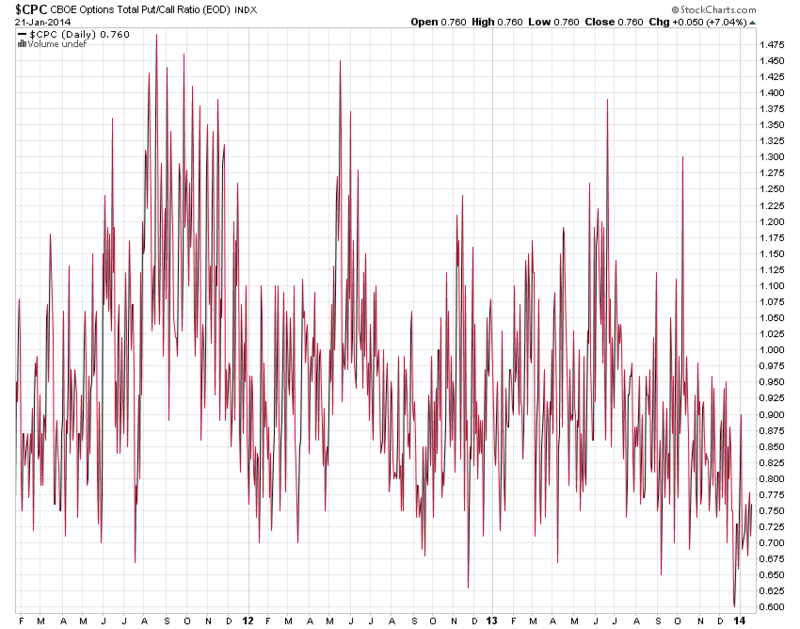 11 years 1 month from the previous peak would have been January 1991. Close to that, Japanese real estate peaked June 1991 and crude oil peaked in October 1990 in a war-associated major spike. 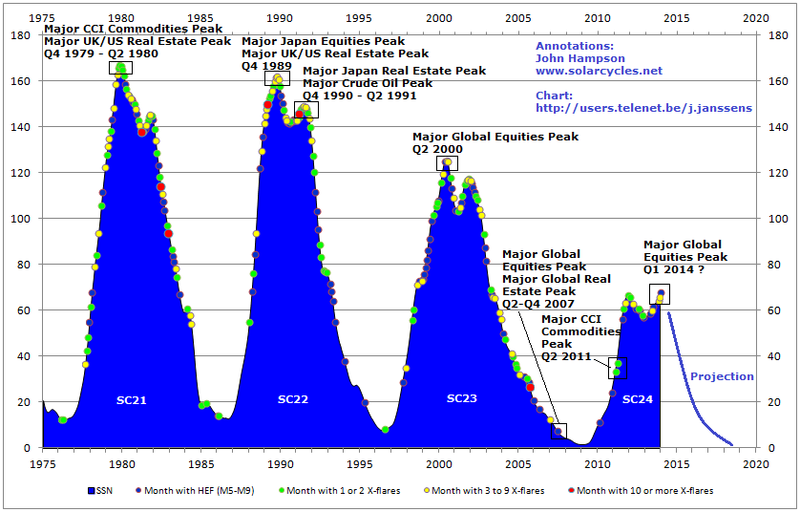 However, we also saw US and UK real estate and Japanese equities peaking close to the actual solar maximum of July 1989. 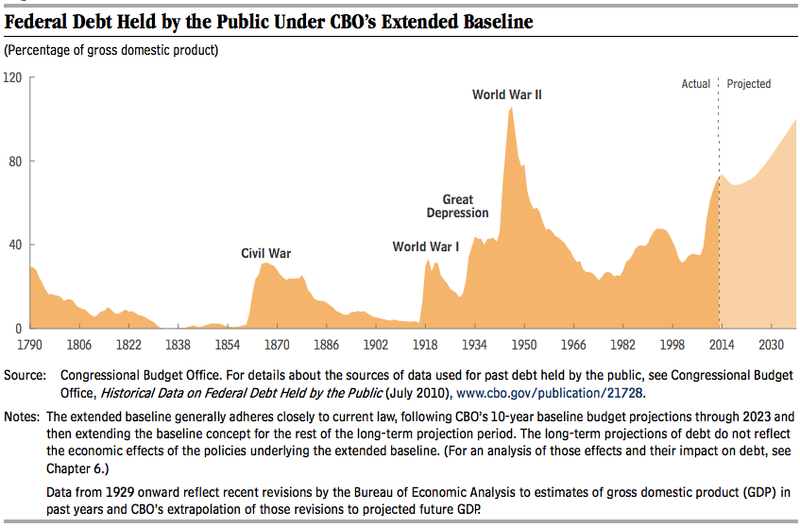 May 1947 was an early outlier. Had it been a more regular May 1948, then we saw wholesale prices and crude oil peaking out around 1948. Yet commodities such as wheat, corn and oats peaked close to the 1947 actual smoothed maximum. That may suggest there is some degree of hard coding of rhythm in human excitement, as well as some degree of variance in speculative peaks according to when actual solar maxima fall. However, when we look at the solar cycle progression charts, we find that the tops of the solar maxima stretched across 1989-1991 and 1947-1948, which suggests there was no anomaly: speculative peaks were in line with actual solar maxima. 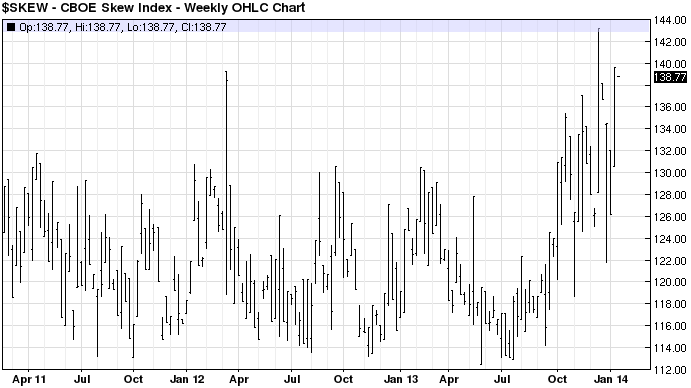 But this is not really the case for the 2011 speculative peaks which fell on the rise into SC24 maximum. Therefore, we need to wait to see if commodities do make a late charge to a high exceeding 2011, wait to see if the solar maximum is falling and completing now, and also to wait to see if equities top out here and deliver a peak aligned with that potential solar maximum, before we can judge this further. Starting on the smallest timescale, and working up to the largest. This adds to the case for a peak having occurred in equities on 31 Dec 2013 (Dow and Nikkei, plus SP500 double top with 15 Jan), associated with the Jan 1st new moon. If that proves to be false and equities break higher, then a future new moon (next one Jan 30th) may produce the timing of the major peak. 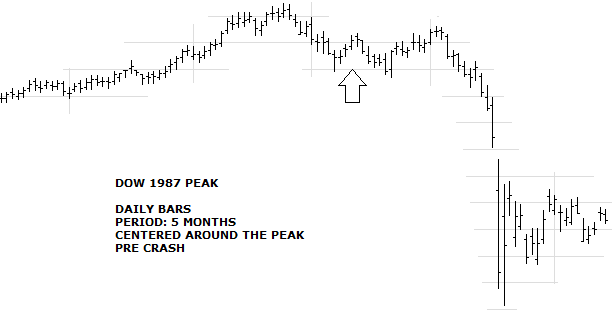 Gold made its secular peak on 21 Jan 1980. Again, this adds weight to equities having peaked 31 Dec 2013, but if that proves false, then we might expect a final peak still to be at hand, in January, before the seasonal model turns down. Solar maxima occur roughly every 11 years and produce human excitement, which translates as protest, war, and speculative excesses in the markets. Major market peaks typically occur at the solar maximum, close to the smoothed peak and on a monthly spike in sunspots. We can measure speculative excesses in terms of market valuations, sentiment readings, leverage and technical indicators and we see a cluster of these in US equities currently. Solar forecasts, solar pole flips and sunspot counts collectively suggest the smoothed maximum and monthly sunspot spike may be occurring Dec 2013 into Jan 2014, which in association with those speculative excess readings, again adds to weight to a possible peak in the Dow, SP500 and Nikkei. Demographics drive secular bull and bear markets, as swells in investor or disinvestor age groups produce periods of upward or downward demand for equities. Japan’s secular stocks bull ran through 4 solar cycles due to a long positive demographic trend from the late 1940s to around 1990. 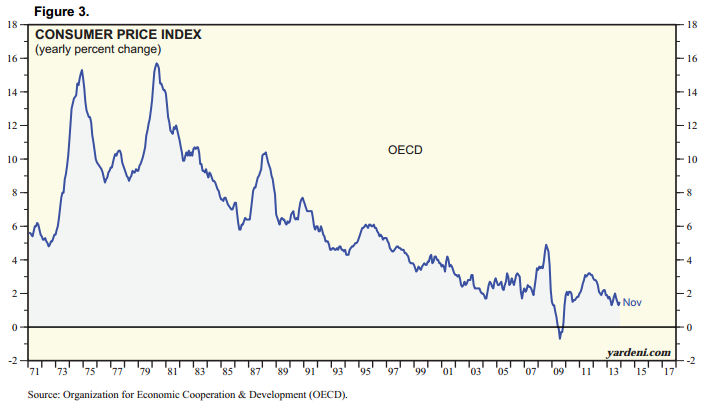 Japan’s middle-to-old, middle-to-young and net investor ratios all peaked in the late 1980s, and accordingly we saw Japanese equities terminate with a speculative excess at the 1989 solar maximum, and thereafter move into a secular bear in line with demographic downtrends. 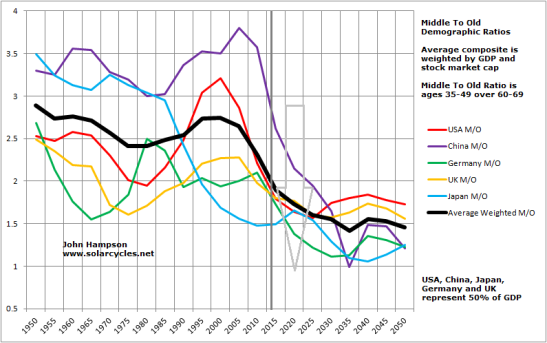 US demographic measures for equities demand peaked around 1965. 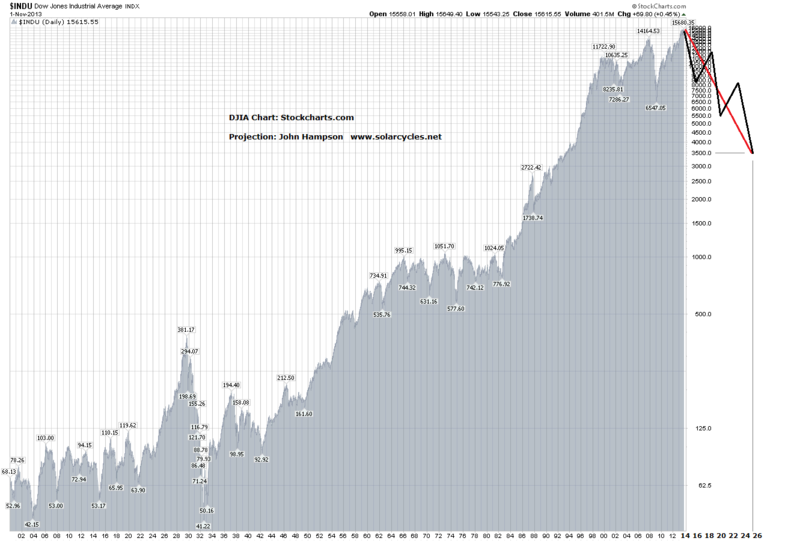 The real SP500 peaked November 1968, terminating with the solar maximum of November 1968. Thereafter US equities entered a secular bear market, whilst gold, as the anti-equities or anti-demographic asset, entered a secular bull market. Demographics and equities bottomed around 1980, whilst gold made its secular speculative peak, all timed with the Dec 1979 solar maximum. 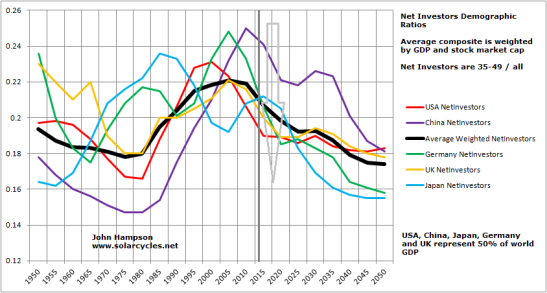 US demographic ratios were collectively positive from 1980 to 2000, enabling a secular bull market in equities lasting 2 solar cycles through the speculative finale of March 2000, which was again a solar maximum. Gold endured a secular bear market through those two decades, bottoming out as demographics turned down around 2000, and entering a secular bull market. Looking forward we see a slight divergence in the 3 charted demographic measures: the middle-to-young ratio bottoms out around 2015 but the middle-to-old and net investor ratios not until around 2025 (shown boxed above). When we draw in collective downward demographic trends for Europe and China, the greater likelihood is of a secular bear in US equities (and a secular bull in gold) lasting through to around 2025, rather than ending now. Solar cycle 25 is predicted to peak around 2023-2025, which would provide the timing for a speculation secular peak in gold. There is a correlation between solar cycles and birth rate, with evidence of an 11 yearly peak in births. There is also evidence of a link between economic prosperity and birth rate, whereby births decline in recessions and bear markets and increase in the good times. Combining the two, we have the framework for alternating positive and negative demographic swells which peak or trough around solar maxima, and hence we have historically reliably seen demographic trends and associated speculative asset bulls/bears peak and terminate around sunspot peaks. Therefore, the secular bear in US equities that began in 2000 is likely to continue through to around 2025, and the secular bull in gold that began in 2000 is likely to continue to and peak around 2025. 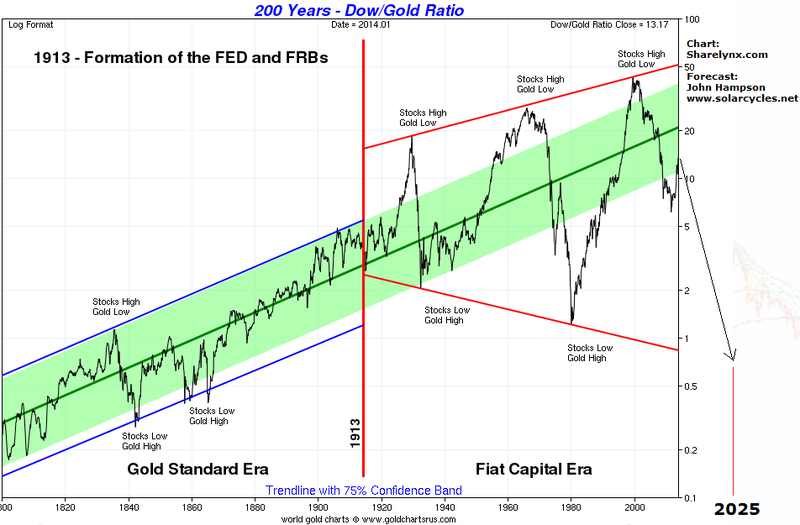 In support of this we see current historic overvaluations in US equities that argue for further reset in stocks ahead, and a lack of speculative mania for gold at the current solar maximum. 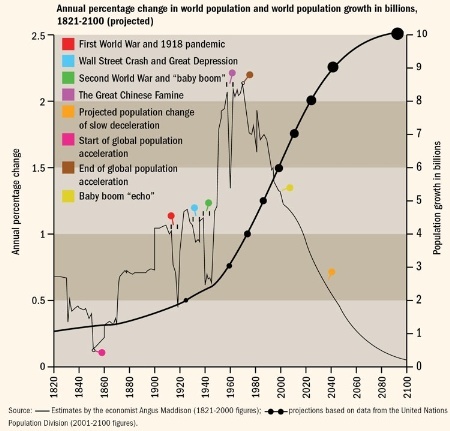 Both charts above model the historic trends in US demographics and the terminations at solar maxima, and the projections forward are the extensions of these phenomena. The ‘mean reversion’ common to to them both reflects the transience of demographics (a young dependents swell headwind will become a middle-age swell tailwind which will become an old-age swell headwind) and the double-excess produced by solar maxima (demographics stretch demand by population, solar maxima stretch demand per capita) before sunspots cycle down again. The biggest mania of all-time is clear to see on that second chart: the dot.com boom. Not only does mean reversion subsequent to that mania have some way to go (a wash out to -50%) but demographics support this occurring. To summarise all the above, and make it useful looking forward, we can time major asset peaks by probability (there are no dead certs, and exceptions occur). Any major asset peak will probably occur close to a new moon, typically around the turn of the year, and normally at a solar maximum. Demographics guide at which solar maximum a secular asset peak will likely occur and whether a solar maximum should deliver a secular or cyclical speculative excess. 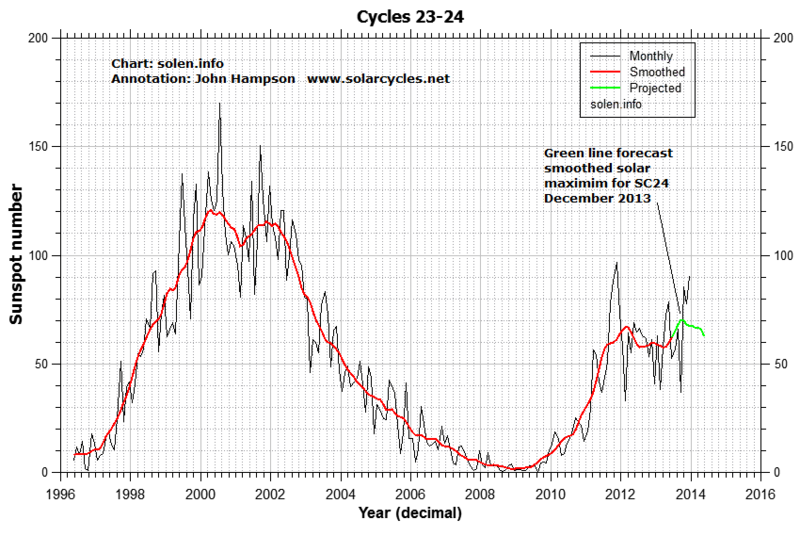 We are currently at the likely solar maximum for solar cycle 24, at the turn of 2013 into 2014. 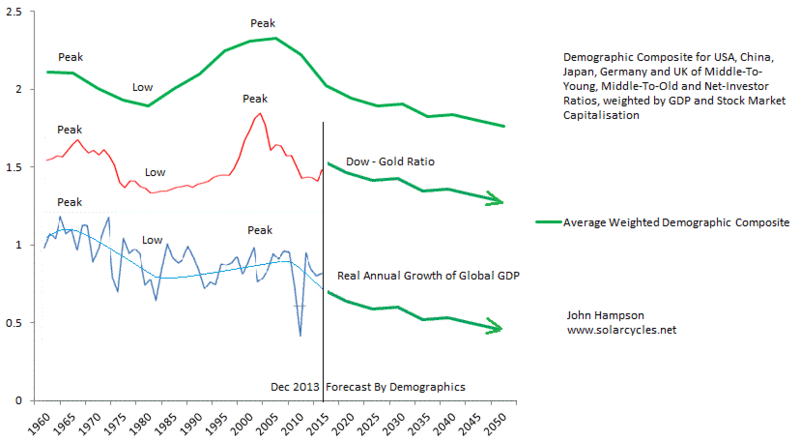 Demographics are supportive of a secular bear in equities (that began in 2000) continuing through to the next solar maximum circa 2025, and similarly a secular bull in gold (2000-2025). 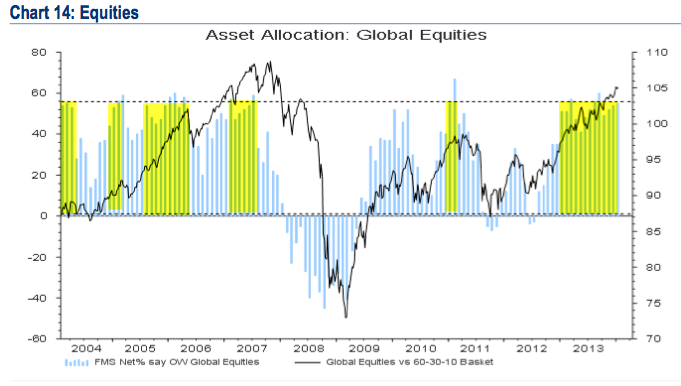 The speculative excess in equities that we are seeing in association with SC24 maximum should be a cyclical peak. The timing of that cyclical peak in stocks has good odds of being around the turn of the year (2013 into 2014) and close to a new moon. That makes a top close to Jan 1st 2014 a contender, and failing that one near Jan 30th 2014 (the next new moon). Again, these are just probabilities, but if we take a different angle and look at indicators such as II sentiment, put/call ratio, skew, deviation above MA, yield-tightening ROC and margin debt, then we have a case for equities to begin to fall ‘imminently’, regardless of solar maxima and lunar phasing. Combining both, the case becomes more compelling for a top here. Gold’s secular bull began in 2000, and like all secular bulls, it has been in a strong dominant uptrend punctuated by occasional cyclical bears or corrections. Below we see the US equities secular bull progression 1980-2000 contrasted with gold’s secular bear in that period (cyclical bulls and bears within an overall downtrend). Gold’s secular bull of 2000-2025 should be a strong dominant uptrend like stocks 1980-2000, or like an extended version of gold’s last secular bull of the 1970s. 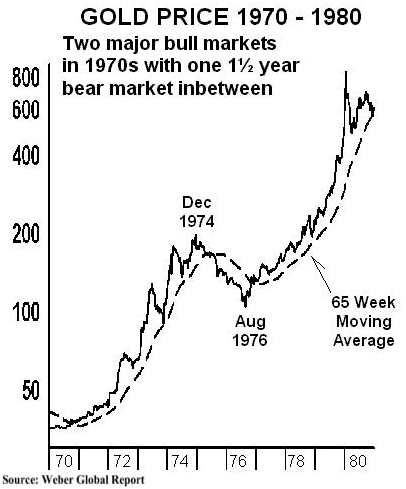 The cyclical bear of Dec 1974 to Aug 1976 occurred as the Dow rallied from a Dec 1974 low to a Sept 21 1976 top, with gold’s secular bull momentum resuming as equities topped out. We could therefore expect something similar to be occurring now, and this is supported in the oversold, overbearish extremes reached in gold and miners and the technical basing that appears to be currently taking place. A threat to bullish resumption in gold is the current excess leverage we see in evidence in margin debt, net investor credit and Rydex leverage. 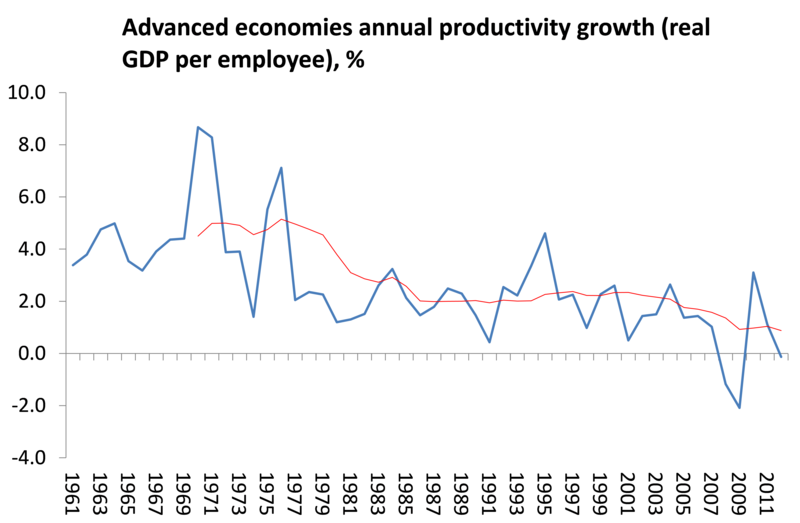 If sharp falls erupt in equities then a period of forced redemptions could mean blanket selling of assets, as occurred in Autumn 1929 and Summer-Autumn 2008. Gold /miners escaped neither, in short-lived but sharp pullbacks. 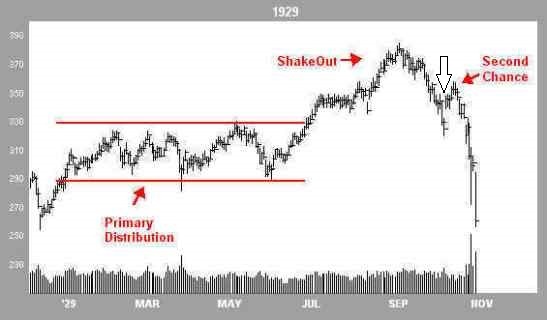 In THIS post I compared the topping process analogies of 1929, 1987 and Nikkei 1989 to the Dow today, and based on that we might expect sharp falls to erupt as of mid-February. 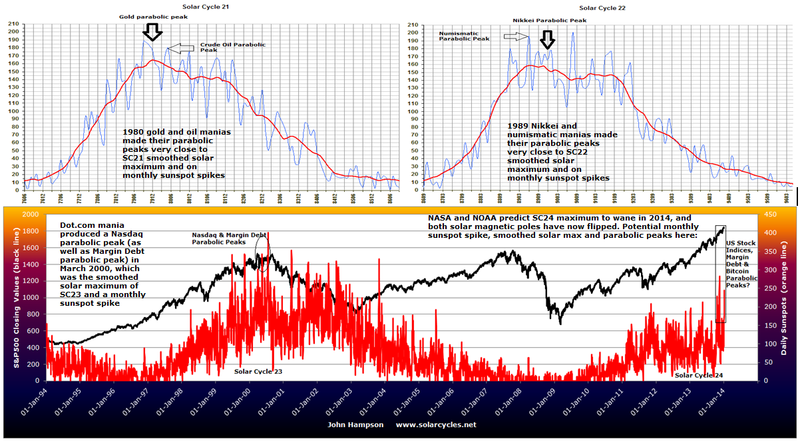 There is a history of steep falls occurring at the seasonal geomagnetism peaks of around March/April and October, and occurring on Mondays once investors have had a weekend to mull over doubts. So by probability we might this time look to the particular potential of Mondays in the period March-April 2014 for heavy falls to erupt. Potentially then, we could see gold and miners rally until then, but be dragged back during such heavy stocks selling, thereafter resuming the secular gold bull in earnest. It is an initially shocking chart, but it is in keeping with deflationary demographic projections and valuations washout. Plus, this has already happened before: to the Nikkei, under the same twin circumstances. Expecting the Dow to be sub 4000 by 2025, and gold to be making a parabolic solar-max finale to a strong secular bull, the Dow-gold ratio should bottom beneath 0.5, potentially even beneath 0.1. But the one factor that I have not mentioned so far is central bank intervention. It is certain that a tipping over into deflationary recession and equities bear will draw further response from central banks. If equities start to decline for the next couple of months but in a measured way and economic data disappoints (as predicted by certain leading indicators) then I would expect the Fed to stop tapering QE and wait-and-see, and otherwise little change. If equities then start to accelerate declines and economic troubles escalate and we enter a dangerous feedback looping, then we should expect the Fed, and other central banks, to up the ante and go more unorthodox. Quite what that will entail remains to be seen, but drawing on history, recent and past, this could mean imposing restrictions on shorting shares, preventing capital from leaving the country, ‘strong-arming’ into treasuries, and more direct, targeted inflationary tactics. There is of course the potential for increased nationalism and for hostilities between certain nations to increase (USA-China, China-Japan) as internal problems escalate. I don’t want to speculate too far ahead, but I see major lasting opportunities at hand in short equities and long gold, tempered by realism over what central banks will do should my projections come to pass. Monetising debt whilst tipping over into deflation under unprecedented collective demographic downtrends which should mean a further decade of secular stocks bear and global economic weakness is a very bleak outlook. As a trader, I think the biggest gains are potentially to be made at the front-end of that, in case the rules get changed. Speculators making money out of an economic crisis are an easy target. It very much depends on how things come to pass, whether we are nursed through another ‘lost decade’ or whether things are about to become acute, under a global deflationary recession, a debt-monetisation end-game or a de-railing and bubble-bursting of China’s economy. In the near term, I continue to look for clues in the markets for the equities/gold, bull/bear switch. I am long gold, short equities, and looking to add to both on further confirmations of reversals in fortunes. Yesterday’s strong up day in the SP500 and Dow claimed back a significant chunk of the previous day’s losses, but less than the full amount and on lower volume. Unless we see follow through on this over the next few sessions to break out to new highs (above Dec 31) on momentum, then this is still consistent with the 1929 and 1987 Dow peaks and the 1989 Nikkei peak, in that we should see several weeks of battling between bulls and bears. I have marked with an arrow where I see us, as the timings in these analogies are fairly consistent with each other. These are guides, so the technical shaping of the indices this time round won’t look exactly like any of them, but the idea is the same: many major topping signals are in place but with such extreme bullish sentiment and positioning, a process is required to gradually change perception. Since Dec 31, we see a tug-of-war between bulls and bears but with an overall downward bias, and the topping process is so far in tact. If I am wrong about the Dec 31 timing and the bulls regain control and we see a break out on momentum, then I would see the markets going yet steeper parabolic before a similar peaking process coming to pass. As previously indicated, the confluence of warnings and flags suggest this should occur by March at the very latest. 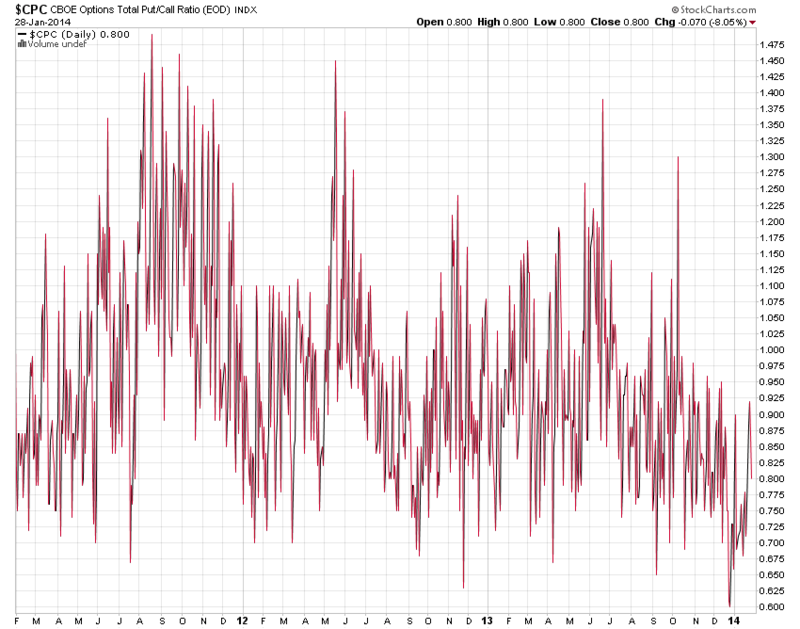 Monday’s falls did nothing to temper the put/call ratio. 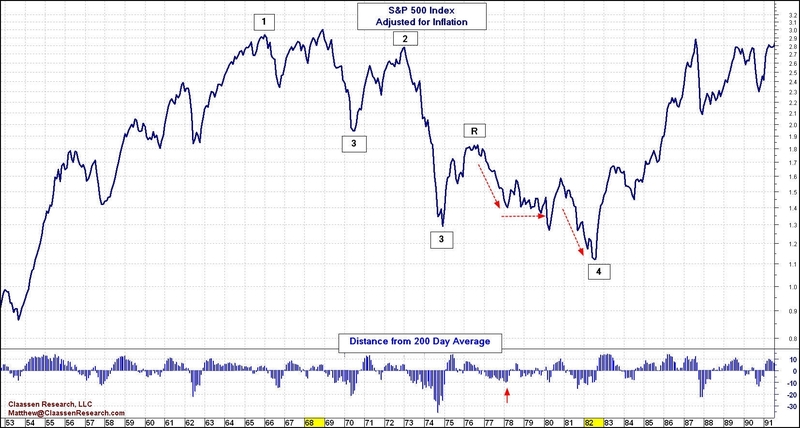 Below is the 17 day average versus the SP500. The current extreme beats the other incidences of sub 0.8, but in both those cases a correction followed. Sentiment against bonds and gold miners remains depressed, whilst bonds, gold and gold miners look finally to be basing. OECD derived leading indicators point to a global economic peak Jan/Feb, whilst narrow money leading indicators point to a global economic peak having occurred around November. Economic Surprises are in the historic high range for the US, and as this is a mean-reverting indicator (analysts will accordingly raise economic forecasts) we should see a a twin-negative going forward in worsening data versus elevated expectations. Earnings season for the US now starts to ramp up, with the most negative guidance on record. In short, I see everything in place for money to exit equities and move into gold and bonds, but this is a process and patience is the key. Dow is up more than 5% five consecutive years now and a sixth such year has not happened before in history. A 5-year bull trend only occurred once before, in the 1990s, and was followed by 3 down years. Third, this is reflective of both the record levels of debt and unprecedented collective demographic downtrends which are now in place in US, Europe and China and are deflationary, recessionary and equities-bearish. Fifth, major speculative peaks have historically occurred at the solar maximum, which is occurring now. 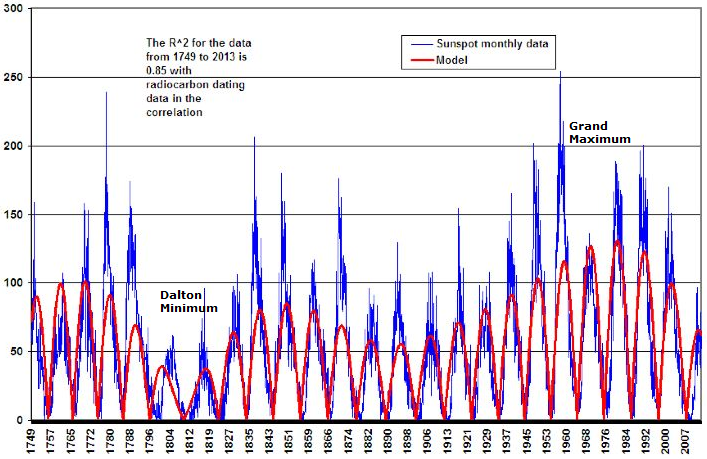 Peaks in solar sunspot activity occur on average every 11 years and have historically correlated with human excitement peaks in the form of protest, war, growth-flation and major speculative parabolic peaks. Again there is biological evidence for this in elevations in oral temperature, pulse rate, blood pressure, and respiration rate, and again few analysts are aware of this critical influence. The evidence for a peak in speculation can be seen at the top of this article, in the congregation of extremes in sentiment, leverage, technical and valuation indicators. 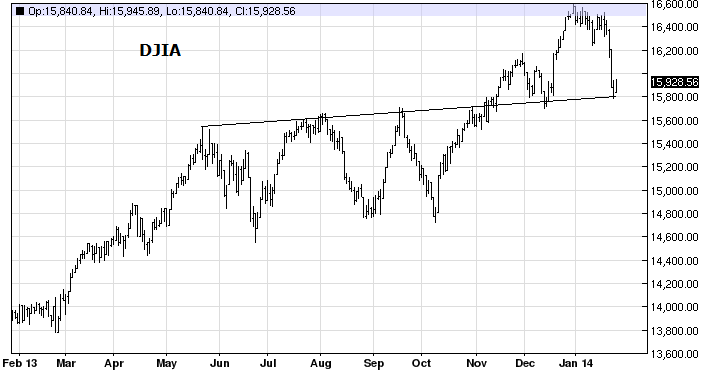 Sixth, drawing all together, there is a case for the US stock market having peaked on the 31st December 2013. 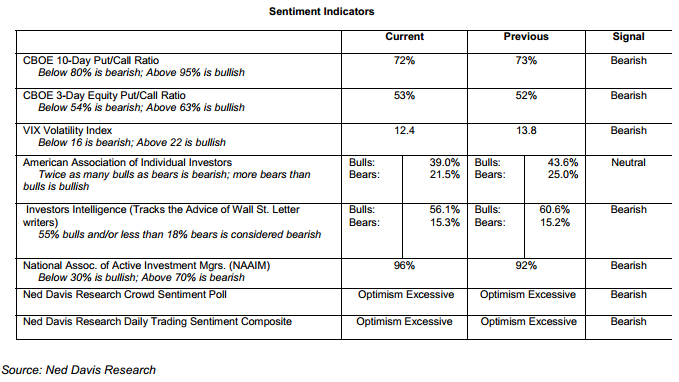 A) We see a wide range of indicators and flags, ranging from valuations to sentiment to leverage to technicals, all pointing to a major peak, right at hand. B) The assumption that the US economy will return to normality this year is one of hope, neither reflected in the data nor in the demographic/debt backdrop. C) Historically major peaks often occurred around the turn of the year, with a cluster falling exactly on the last trading day of the year, and this reflects the annual seasonal peak which is caused by the seasonality of geomagnetism. D) Historically, major speculative parabolic peaks have terminated at the solar maximum on a monthly sunspot spike, which is likely occurring now in Dec 2013 / Jan 2014. Specifically, where solar maxima have fallen near the turn of the year, speculative parabolics have tended to terminate on the last trading day of the year, in line with the seasonal peak. 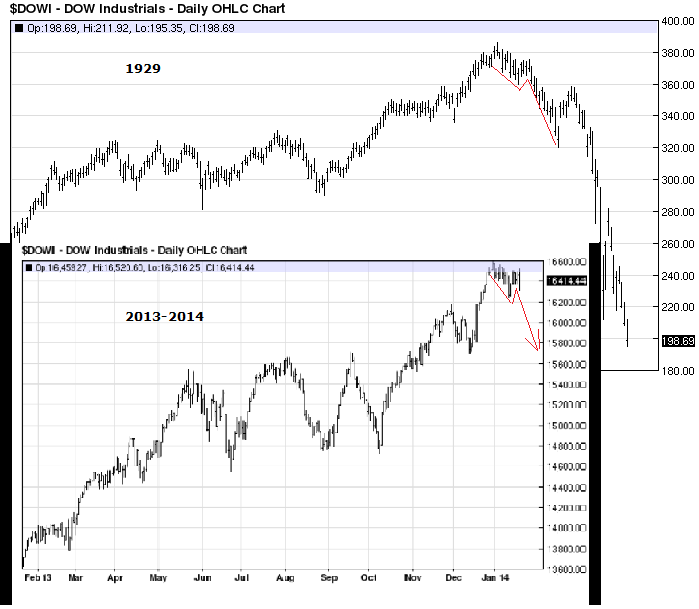 The real highs of FTSE 31 Dec 1999, Dow 31 Dec 1999, Nikkei 29 Dec 1989, and Dow 31 Dec 1968 were all such occurrences. This is a dual confluence of peak sunspots and peak inverted geomagnetism.